Can I use my home as my pension? It’s more than likely your biggest asset; something that you spend thousands of pounds on every month on improvements and mortgage payments to slowly but surely make yours. But can your home replace the need for a pension? If you own a property and pay off your mortgage monthly then it’s easy to see this as your nest egg in old age, rather than directing your remaining disposable income to pay monthly into a pension. After all, house prices have generally risen over the past few decades. Many plan to sell their home, move somewhere smaller and live off the equity from that sale in retirement. As simple as that sounds, we don’t think that your home can ever really replace your pension. A pension can provide you with a steady income, while your home may not. Your home’s value may fall as well as rise, too – so it’s not always sensible to rely upon it. And your circumstances can change; you may need to re-mortgage in the future to pay for a child’s university fees or split the property in the event of a divorce. 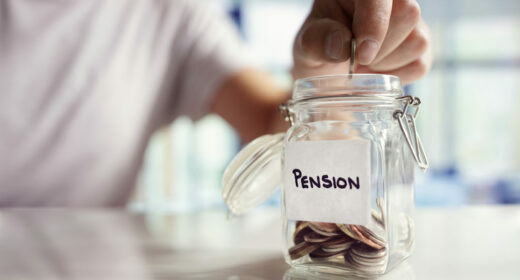 While pensions also have the benefit of being one of the most tax efficient savings options; for every £80 put into a pension by a basic rate taxpayer, the Government will contribute an extra £20. See how much cash you could release from your home with Key Retirement’s free equity release calculator. It displays results instantly online giving you a calculation for a lifetime mortgage and an enhanced lifetime mortgage. That said, there are a variety of different options available to people who do want to use their house to supplement their pension or other sources of retirement income. Here are some options to consider, along with both the advantages and potential pitfalls of each. Probably the most important thing to remember is that there will be work involved: you’re responsible for the upkeep, as well as for agreeing rent. You’ll also be sharing parts of your home with somebody new, which may take some adjustment. Another option for those aged 55-95 could be equity release. The most common type is a lifetime mortgage, which is a loan secured against your home that allows you to remain the owner of your home. A lifetime mortgage provider will lend you a portion of your home’s value and, in most cases, the loan plus roll up interest will be repaid [from proceeds from the sale of your house] after you either move into long-term care or pass away. This could give you access to a large chunk of money, to use for anything from funding home improvements to helping out family members. There are a few things to be aware of, including the fact that any existing mortgage will need to be repaid before you can use the cash for other purposes. Equity release will reduce the value of your estate and could also affect your entitlement to means-tested benefits. Not every property is eligible for equity release, and you wouldn’t be able to take out a plan and also let your home to a lodger. A final popular choice is downsizing. This involves moving to a smaller home or a home in a cheaper area, leaving you with some spare money to help make life more comfortable and, potentially, reduce your ongoing costs on things like upkeep and maintenance. Of course, the biggest downside is the fact that you’ll have to leave your home, and any emotional connection that you have with it. It’s not always practical to move, and there can be quite a few upfront costs not least stamp duty, so if this is a path you want to go down it’s important to budget properly and be prepared by investigating the house prices for smaller properties in the area you want to move to. This article was sponsored by Key Retirement. Taking out an equity release plan is a poor option in most cases, and does not make financial sense. If you are 65 you will only release about a third of the value of your property in cash. Given average life expectancy, the interest accumulated will pretty much render the equity in your property non-existent by the time you die. Equity release only really works if there are no family members you wish to leave money for, and you desperately want to remain in your existing property for the rest of your life. For most however, downsizing to a smaller property will be a far more attractive option – both financially and practically.